HTC has announced the launch of new smartphone HTC One M8. The Phone Powered by Qualcomm Snapdragon 801 SoC and comes with a duo rear camera setup. HTC One M8 Runs on 4.4.2 Android KitKat. The phone comes with 2GB of RAM. 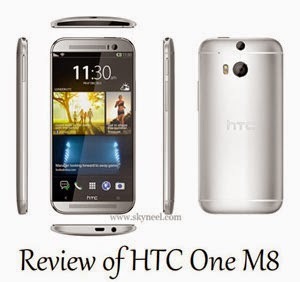 HTC One M8 Powered by Quad-core 2.3 GHz Processor. It has a powerful processor. It has Snapdragon Qualcomm MSM8974AB 801 with 330 Adreno GPU. It has 2 GB RAM with 16GB/32GB ROM and user can be expanded memory up to 128GB via SD Card. HTC M8 comes with Super LCD3 5.0-inch touchscreen with Resolution 1080 x 1920 Pixel. It has Dual 4 MP Rear Camera with 2688х1520 pixels, dual-LED, Auto-focus, 1/3” sensor size, automatic simultaneous video and image recording, geo-tagging, 2µm pixel size, smile and face detection, panorama, HDR, and Front 5 MP camera. HTC One M8 is a stylish phone. It has 146.4 x 70.6 x 9.4 mm, dimensions and phone weight is 160g. HTC One M8 runs on 4.4 android KitKat. The Smartphone has a compass, Accelerometer, proximity and Maps, Calendar, Google Search, Gmail, YouTube, Google Talk, Alarm, Calculator, Clock, and other Google sync apps. This is power pack with loaded lots of features and apps. M8 has 2G, 3G and 4G network in GSM Smartphone. It has Wi-Fi, Bluetooth, GPRS and EGPRS or EDGE, with 2600mAh Non-removable Li-Ion battery. 1. HTC One M8 has good processor and RAM. 2.It has 5.0-inch Super LCD3 capacitive touchscreen. 3. One M8 runs on latest Android version 4.4 Kitkat. 4.The Phone has Dual 4 MP Rear Camera with 2688х1520 pixels. 5. One M8 has 4G LTE Capability. 1. HTC One M8 has Heavy Weight. 2.The Phone has Non-removable Battery.